•Polished diamonds in all shapes and sizes, from 10 points to extremely large sizes of 10.00 carats and more. •Parcels, single stones, matched pairs and layouts. 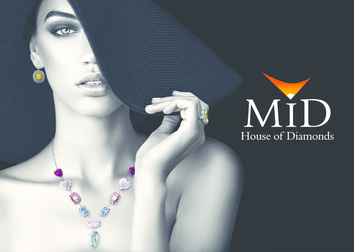 •Certified diamonds, from GIA, EGL, AGS, HRD and IGI. •Premium cuts to value cuts, in all shapes and sizes. •The full range of standard colors, and natural fancy-colored diamonds. •Bespoke, one of a kind of jewelry items, set both with white and fancy diamonds. MID’s mobile Application allows you to view, sort, and inquire over 10,000 stones, consisting of white and fancy color certified stones. The app also enables you to view multiple V360 diamond imagery and prices.